Fit-Ink: Are You a Gym Diva? Talking on your cell phone. Making a grand--and late--entrance to class. Sweating for hours on a machine and not bothering to clean up after yourself. Sound familiar? You've just met a gym diva. We've all seen them, some of us might have diva tendencies of our own, and some of us might roll our eyes when we spot them at the gym, hoping that they don't take the machine next to us or sit for hours on the next weight machine in our rotation. 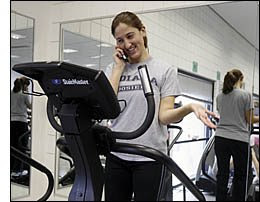 But after a story I read at msn.com about exercise etiquette, this self-professed gym nut found out she has some diva tendencies and isn't too happy about it. I'll admit to talking on my cell phone, although I only do it periodically and either when the gym isn't packed and I can't get my mom off the phone or to make a quick call to say I'll be home in an hour. But some of the other characteristics described by Peggy Gregor, a group exercise director at Healthtrax Fitness and Wellness in Bethel Park, Pa., nearly make me president of the gym diva club, and some of my friends could be its officers, at least when it comes to spinning. Staking out the same exact spot in class each week. Guilty as charged. I'm slightly miffed when someone arrives even earlier than I do and stakes out the bike I like to ride in spin class. I like my spot...my friends sit near by, also on the same bikes they claim week after week, and it's one of the few bikes in the front row that doesn't have sticky tension spots, a whacked-out seat or wobbly handlebars. Claiming this spot to then look at yourself in the mirror. Again back to the spinning. I've witnessed this in classes I attend where someone checks herself out constantly over the course of the hour. Some might blame me for this type of behavior too: My claimed spot is right next to the mirror for easy viewing, but I'm not checking out a "hot bod" but monitoring my leg speed and positioning. Easily mistakable though. Chatty Cathys who come late and make a scene. Lately I've been much better about getting to class on time, but when I used to rush from work and inevitably get stuck in traffic, I was notorious for arriving within the first five minutes of class. As for making a scene, that would be unintentional. If you become friendly with the instructor, he or she says hi when you walk in to recognize your presence. Soloists, who stray from the instructor's lead to do their own workouts. While Gregor says soloists break from the routine to garner attention, I don't agree that it's always disruptive. I've skipped a fast run on the bike to ride into a headwind or climbed in the saddle instead of out. And not to single anyone out but someone rides in class wearing a hoodie--with the hood on--to hide wearing headphones even though blasting music penetrates the room. Sure, I'm primarily relating my example to spinning, but it can work in other classes too. Think about a yoga class where you might not be able to move into a pose and have to improvise. Or those in a group fitness class who just don't get the routine and are out of sync the entire time or only partially completely each move. I saw it last week at a strength training class. Did I care that this man couldn't hold the Clubbells properly and missed some of the moves? No.